I know we are on the countdown to the christmas red cups at Starbucks which signify their festive drinks, but to keep us going they have released some autumnal treats. New to the menu are Mulled Fruits drinks, available in apple or grape. I went for the grape version and crossed my fingers it wouldn't taste too much like the American grape flavour you get in imported sweets. I still couldn’t resist choosing grape over apple as it sounded a bit different. When my drink arrived it came with a cinnamon stick floating on top making it look like a lovely brew, dark purple in colour. I noticed the poster above the counter showed a slice of orange in the example drink as well and I probably should have queried it, but went on to just go and get a seat as it was so busy. The flavour was rich and fruity and the grape tone was delicate, and sweet. It was like an English grape in flavour, giving it a slightly wine like taste, obviously alcohol free though. The best part of was the seasoning of chai spices that made this such a good cold weather drink. Each sip was so soothing and sweet, it was a pleasure drink. I should point out my bias for cinnamon, it is my favourite spice. The best thing about the cold weather is that it gains a certain popularity and starts appearing everywhere. As the drink went down the intensity from the cinnamon stick rose, as it had time to brew but less liquid to dilute it. This meant that the very last mouthful was delivered with a spicy buzz, perfect preparation before venturing back out into the cold. 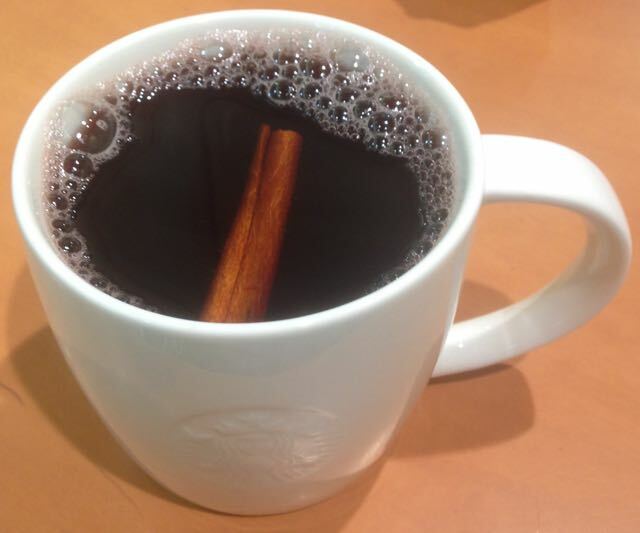 I am loving the Grape Mulled Fruits Drink and can't wait to try the apple version next time I'm at Starbucks.